A bit wooly, but I like it. The Scottish Falsetto Sock Puppet Theatre know how to keep a winning formula. It’s quite old-school in this regard; some of the jokes are awfully familiar from last year’s show, and the structure is practically the same. But, you wouldn’t criticise Morecambe & Wise for not fixing something that ain’t broken, so I don’t see why this should necessarily be a problem with their knitted counterparts. The theme this year is science fiction, with a range of sketches referencing the likes of Alien and Star Wars; the latter giving the show its best pun. And the socks certainly know how to pun. There are still more groans than BabeStation. It’s good to see the controversial Peter Capaldi sketch make a reappearance, in an abbreviated form, via audience consent. This show comes highly recommended, with a word of caution: try to nab one of the tiered seats, because vision can otherwise be obscured fairly easily (the Socks are not as tall as humans!). Enjoyment and rhythm is somewhat compromised when you spend a lot of time dodging the heads in front of you. The Scottish Falsetto Sock Puppet Theatre have established themselves as firm festival favourites. 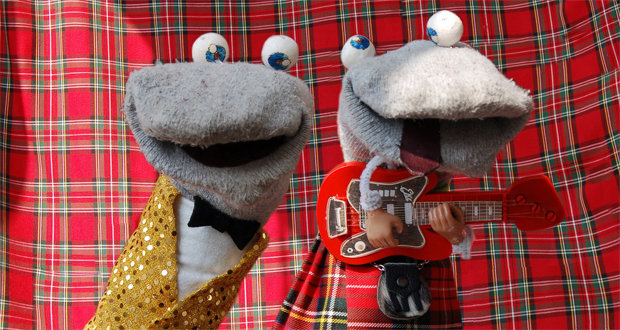 The Scottish Falsetto Sock Puppet Theatre are appearing at the Gilded Balloon until the 25 August 2013 (not 21).